Like many people I have multiple computers with 6 channel audio output intended to drive 5.1 'surround sound' speaker systems - and no wish (or space) to position multiple sets of speakers around the room. It also makes no sense to drive more than one set of speakers 'at the same time' - so there is just no point in having more than one 'set' in the same room anyway. 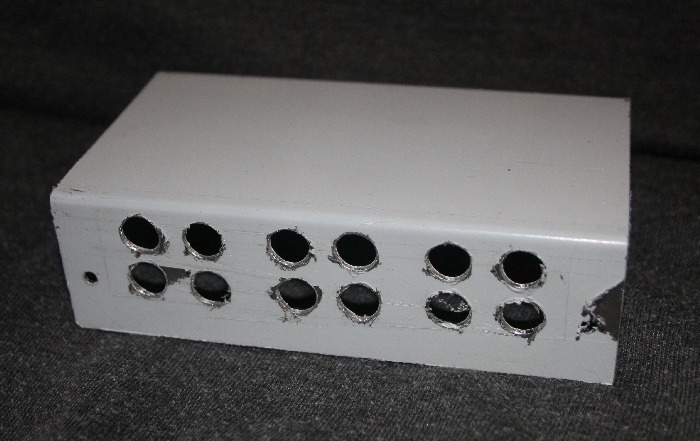 Unfortunately, there appears to be no such thing as a '5.1 speaker switch' = so I decided to build my own ! 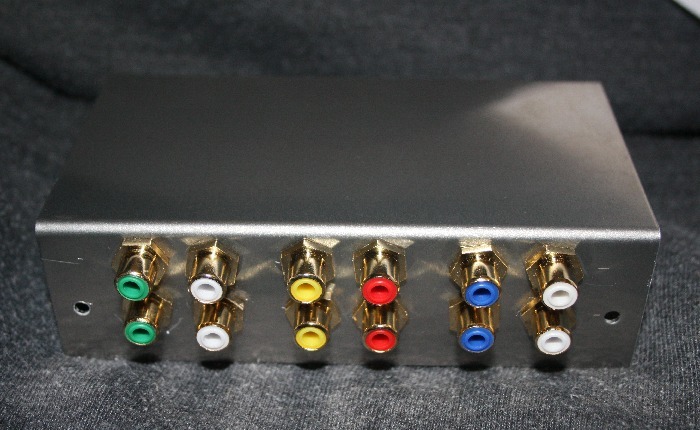 More modern computers come with HDMI output, which is fine if you have a home cinema 'decoder amplifier' that accepts HDMI input (or use a HD TV with built in Surround Sound as your 'monitor'), since HDMI switches are easy to find. I've seem some designs that use a set of 3 '2pole 2way' switches - however this is rather 'inelegant' - so I quickly hit on the idea of using relays. The drawback is, of course, that with 'normal' relays, the contacts 'default' to one position when the 'power is off' and if you want the other position you have to keep the 'power on'. Fortunately, I remembered the box of 3v 'latching relays' (type DK-1a1b-L2 3v) I purchased for my 'Barn Door' / "star-tracking" project. These wonderful little units have internal 'magnets' that 'hold' the relay contacts in position i.e. the relay contacts can be driven into position by a 'pulse' of power since, when the power is removed, the contacts remain in the last set position ! The relay has two switch 'coils' inside - you just have to apply momentary power (eg. via a push button switch from a 3v battery) to one coil and the contacts 'click over' to the 'activated' coil position. They then remain in that position until power is applied to the other coil. This means you can build a battery operated switch that only uses power when one of the push buttons is pressed ! 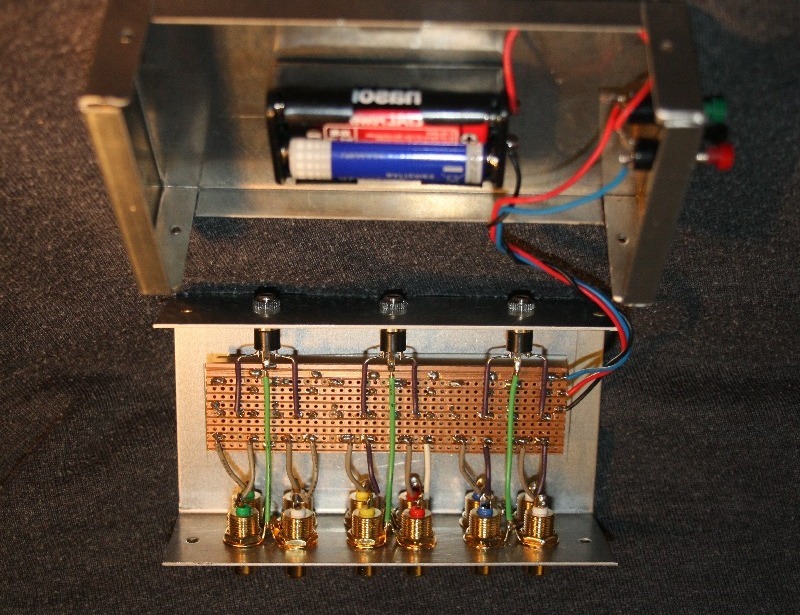 The wiring of a single relay (pins side) is shown - this is duplicated for the other 5 channels. Each 'channel' has it's own relay (6 channels = 6 relays). 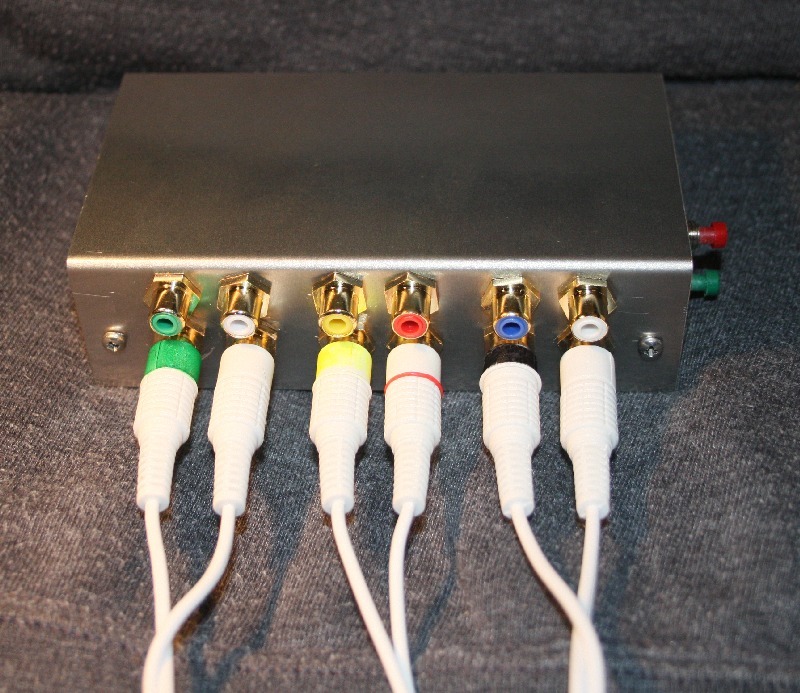 The RCA Phono socket input channels will be arranged as 2 rows across the long side of the box, so each relay can 'pick up' it's two inputs (one above the other - one is shown as red, the other green). The output 3.4mm sockets are on the other long side of the box, and each socket picks up 2 channels (from adjacent relays) - in this case I've shown each one as a co-ax cable (red jacket, green signal, earthed at the relay board). 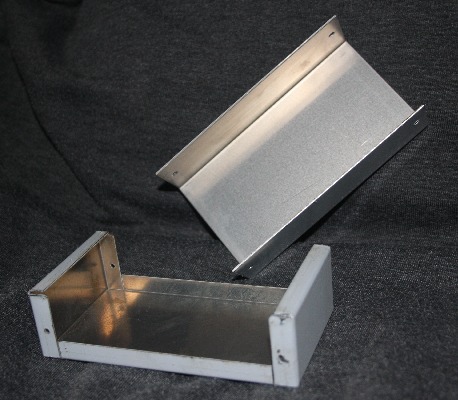 I soon discovered that 'Project Boxes' cost an arm & a leg (especially aluminium ones). It also turns out that most boxes that are 150mm long are 50mm or more high, so keeping the height down means dropping the length. I ended up selecting an ABS box from CPC (part EN82869 - 120 x 65 x 40) this is a bit short, but the height would allow the battery holder to be stuck to the lid. ABS is non-conductive, but I expected that all the internal connections would be short enough to minimise any 'noise' pick-up (remember - the signal will be digital PCM pulse trains, so it should be virtually immune to audio noise) - even so, my "anti-noise 'plan B'" is to always glue some aluminium foil to the insides of the box. Needless to say, when I went back on-line to buy it, it was 'out of stock' !! Despite their prices**, I went back to the Maplins web site - and after hours struggling with their hopeless layout (you have to open up the individual 'details' of one box after another to discover it's dimensions - plainly the size is not something that Maplins thinks is needed in the short description), I eventually managed to find the ideal aluminium box (part no. LF08J, 133 x 70 x 38) for not much more than my 'first choice' ABS one from CPC ! .. plus, wonder of wonders, they actually had it in stock !! ** I no longer buy components from Maplin as their prices are generally at least double what you might pay at CPC or on eBay. In fact (so long as your order qualifies for 'free postage'), CPC often works out a bit cheaper than eBay (plus you generally get it 'next day', not next month) ! The whole layout is governed by the box. The long sides of the project box are part of the box lid. So, after the RCA socket wires are wired to the track side of the circuit board it will no longer be possible to get access to the 'component' side. 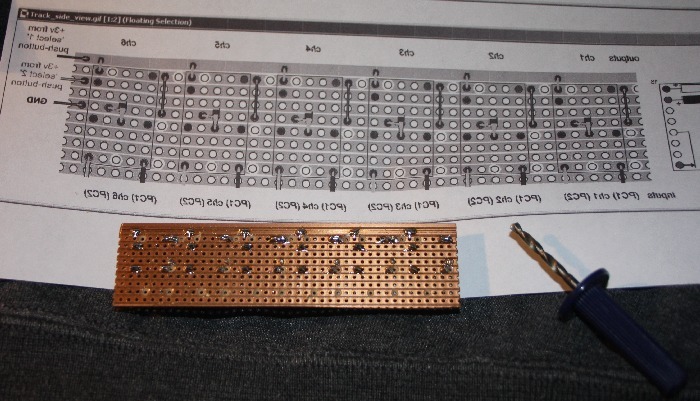 This means that all the 'component side' items will have to be be soldered in first (i.e. the wire link and the relays, not forgetting to 'bend pin 16 to the top 'Select 1' track). I then added some 'flying leads' for the GND, Select 1 and Select 2 control switches. With these 'reference points' in place, the vero-board track 'cuts' can be made (I used a hand-tool - essentially a 2mm drill with a handle - to 'grind off' the track at the holes where the 'cuts' were required). Having done the basic vero-board wiring up, the next step was to make all the 'cuts' on the track side (and then make sure the relays were actually working, both 'switch over' and 'hold'). It was at this stage that I decided to leave out the LEDs - six relays switching at the same time made such a nice loud 'click' that there could be no doubt they were working ! When I came to drill the RCA socket and switch holes all in the same side, it became obvious that there really wasn't enough room to fit it them in. I thus decided to move the switches onto one of the 'short' sides in the base. You will note that the shite/grey protective plastic covering is starting to come away at the edges - this is due to my over-enthusiastic filing down of the 'burrs' left over from the drilling (that's what you get if you use blunt drills :-) ). I decided to do the same, but, of course, needed two RCA sockets for each stereo 3.5mm to RCA cable. The 'tip' pin was 'white', so I coloured this. The 'middle' pin was tagged with a red band, however since the 'yellow' was hard to see, I decided I would only keep the 'red band' on the yellow cable (and use a red socket), whilst removing the red band from the green & black cables (and use white sockets). Since the 'black' RCA socket was 'out of stock', I purchased blue instead. You can see the result, left. The photo has been 'flipped' so it aligns with the others (i.e. sockets at the front) which is why it looks a bit odd. Wrap up - what would I do different next time ? The socket layout is not actually 'optimum' for running cables from 2 computers. With two computers quite close together, the obvious place for the switch would be positioned at the back / top of one, with the RCA inputs 'naturally' facing toward the 5.1 outputs on the back of the computers. Of course, this would make the push-buttons very hard to reach. I wouldn't bother with 'select' switches 'on the box', instead I would just fit a socket to support a 'remote control' rocker switch. This would allow the switch to be positioned behind the two computers (and thus shorter 5.1 cables runs). What's it all cost ? All the components (less the relays) came to about £25. If I had to buy the relays, they would cost well over £5 each, more than doubling the cost ! This page last modified: 29th May 2018 14:41. Page Clicks to date: 3. User 54.90.86.231 @ ec2-54-90-86-231.compute-1.amazonaws.com.